On Thursday, we went out for our weekly date night: dinner and Dark Shadows at the movies. I wore an entirely new outfit. I was feeling like a big poo all day (note the wild hair) on Thursday and the only way to get me out of the house in a good mood was color. Thankfully, my brand new, gorgeous, fabulous, comfortable wedges from Modcloth came in the mail. These shoes looked amazing on the site but reviews noted that they run quite big. I usually wear a size 9.5-10 and have wide feet so I ordered a size 9. Like many other reviews said, the ankle strap could use an extra hole to make them fit a bit tighter but other than that, these shoes are perfection! The color is darker and more golden than the Modcloth photo and they are gorgeous. If they had these in other colors, I'd probably buy one of each. I wore them all day and they were wonderfully comfortable. 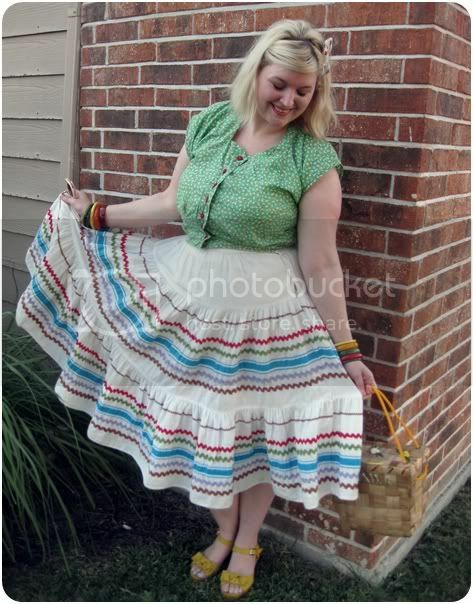 Also, my new favorite skirt from local St Louis vintage shop Retro 101. I went down last weekend to meet a blog reader and while shopping, I spotted this gorgeous skirt. I think it may have been part of a two piece sqaw/patio dress. Do you think I should make a matching blouse this summer? I adore a yellow pair of shoes- I seriously have 5-6 pairs! I think they go with everything. Yours are adorable and the outfit is so happy! Glad you had a wonderful time on your date night. Wow! I love that outfit, I love those peasant skirts (I only have one and wished I had more). I would say for sure make a matching top for that skirt, that would be fun! The whole outfit is so pretty and bright. I'd say go for it on the blouse front, Those 2 piece/mix n match sets are so fun and versatile, and the skirt is too lovely to not find a new mate! That outfit makes me happy. 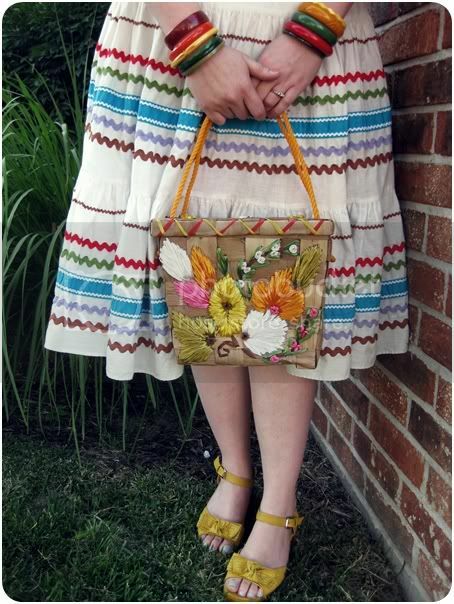 So colourful, love your skirt, love your shoes and the Jamaice handbag just finish the picture. Yes, new holes are a must for these. my hubby does leather work as a hobby so he just used an awl to poke a new hole. I think you can find awls in most craft supply stores. I use them on shoes, belts and purse repair. they are so sharp, they slide through like a hot knife through butter! So pretty.. Love the whole outfit.. Shoes just set it off. O,I love LOVE your pretty skirt! You look very fresh and pretty and Springy! Hope you liked Dark Shadows,I loved it! Ooooh... yellow shoes!!! :) They make me happy and they are not even mine! Squeeee love the outfit and the shoooes! I continue to be excited about yellow and those are adorable! 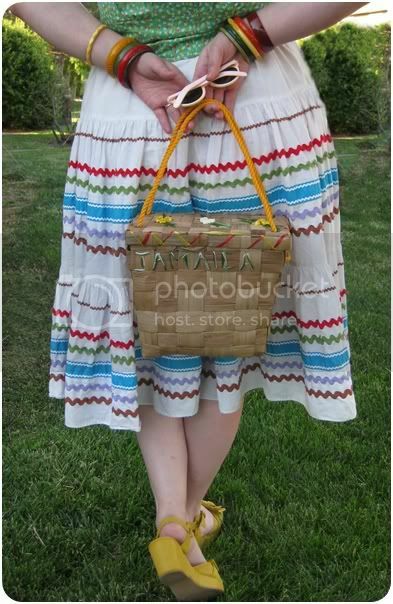 I love the patio skirt. 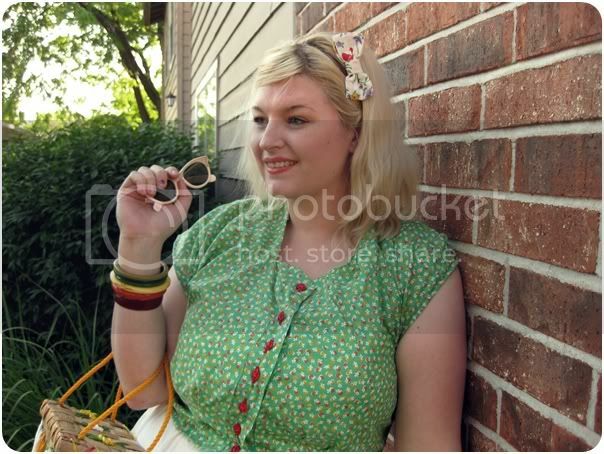 I think it would adorable to have a matching blouse for summer, plus then you could mix and match. A peasant blouse trimmed with rick rack would probably be just like the original top (if it had one)! I adore colour and like to wear a rainbow some days to help lift my spirits, too. Earlier this year I bought a stack of rainbow bangles (I think there's six colours) from Forever 21 and have been living in them (whether all together or split into some combo) ever since. You look completely darling, sweet gal - and those shoes...what can I say? Footwear perfection! I've been wanting those wedges for a while!!! Can you tell me what the bottom of them is made out of? Would they be easy to dance in or are they rubber and would stick to the dance floor? Thanks! i really really love this outfit, so joyful! Just found your blog and I love your fashin style and writing style too! very cool! I followed and can't wait to read more.